The Humboldt Park Chalet was built in 1976 and dedicated in July 1977. Originally there was an art deco style bandshell, built in 1932 (during the Great Depression) as a Works Progress Administration project. It was destroyed in 1975 due to a fire set by arson. The new design is noted for its acoustic excellence. Many organizations contributed to the cost of the new construction. In partnership with Milwaukee County, the Bay View Neighborhood Association (BVNA), summer concerts "Chill on the Hill" are held during the 14 week summer season. Attendance averages about 2,000 people who gather each Tuesday evening to enjoy the music on the sloping grassy hill area. 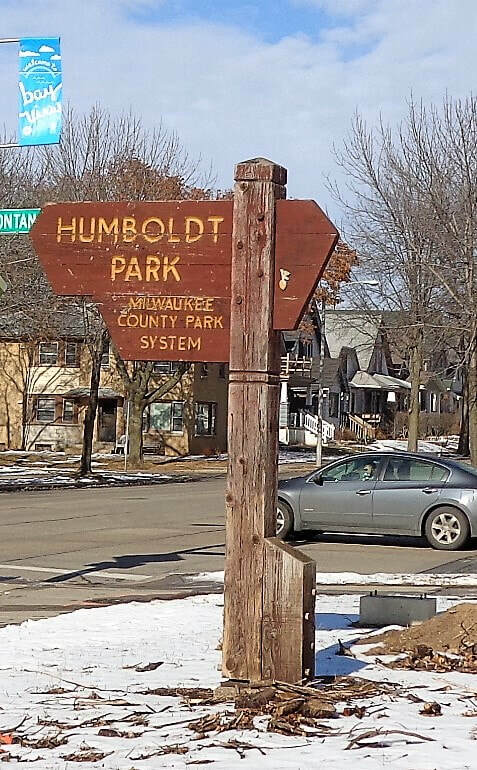 The park includes a beer garden, the Humboldt Pavilion, Helios Multigym, a lotus pond baseball fields, horseshoe game area, and a wading pool. The World War One memorial,located just west of the lily pond, was dedicated in 1921 honoring soldiers of Bay View who died in the war between 1917 and 1918. Additional land was acquired in 1922 bringing the park to its current size of roughly 71 acres. Two landmarks were constructed by the WPD during the Great Depression: the current farmhouse style pavilion and the original Art Deco style band shell. In 1936, city and county parks were consolidated under Milwaukee County creating the current nationally recognized park system. The maintenance building and adjoining wading pool was constructed in 1962. Unfortunately in 1975 the original band shell fell victim to arson and was destroyed by fire. As a result, the current Swiss chalet bandshell was built and dedicated in 1977. The Friends website also has photos of the original bandshell. Other history of the park can be found in the Bay View Compass.